Among many other, equally attractive, characteristics, I can definitely tell that I'm getting older because I walk around making comments like, "is it really November? Where has the year gone? Hasn't this year just flown by?" Please tell me that I'm not alone! Continuing with my strengthening and physical therapy exercises; making good progress! 19 miles - sadly, I only ventured out on my road bike once this month; half marathon training has taken over! What Happened by Hillary Rodham Clinton - Many supporters of our nation's first female presidential candidate have mentioned that they are reticent to read/listen to this book for fear they will feel sad or disappointed; however, I have to say that there were many instances when I caught myself laughing out loud. Clinton has gained quite a bit of perspective, in a relatively short time, since the campaign and election; I appreciate her candid account and highly enjoyed her work, especially since she is the narrator for the audio version. Braving the Wilderness by Brené Brown - This is a quick listen, but definitely not short on wisdom; I chose this one for the October Readathon, starting it during a Saturday long run and I finished it up while doing chores in the afternoon. I have always enjoyed Brown's work, and her latest seemed to especially resonate with me. 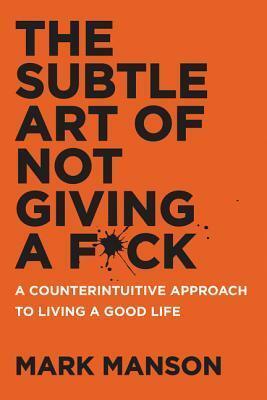 The Subtle Art of Not Giving a F*ck by Mark Manson - I'm not finished with this one (putting it aside as I listen to something else for Nonfiction November book club) but, so far, I have enjoyed it. The Ninth Hour by Alice McDermott - When the narrative is well-written and the story captures my attention, I love historical fiction; thanks to a recommendation from Susie at Novel Visits, this was a delightful read and I'm so glad I gave it a shot! Are You Sleeping by Kathleen Barber - Stuck without a book and no time to really figure out what to read next, this recent release was available from my library and looked to have some good reviews. Touted as a great choice for fans of the podcast Serial and the novels of Ruth Ware, I thought I'd give it a try; it started off like a winner, but faded in the second half. The Rules of Magic by Alice Hoffman - Feeling another slump coming on, I scrambled to find something redemptive; Catherine at The Gilmore Guide to Books rescued me with this recommendation! This might be the perfect fall weekend read, y'all; highly recommend! Don't worry, there's magic beyond the magic; Hoffman's writing has never been better. The Grownup by Gillian Flynn - This is a short story but I'm including it because if you need something quick to keep your brain occupied don't hesitate to spend a few minutes on this mind boggling story by the author of Gone Girl; when you finish, I can guarantee your mouth will be hanging open. This is How It Always Is by Laurie Frankel - This one has been recommended to me by, oh, everyone? Most recently, I was reminded of it by Andrea at Born and Read in Chicago and I finally made time for it. WOW. Now, I know why they've all been so passionate about this one. I feel like I learned so much and gained a new perspective from Frankel's novel; a must read. In the Midst of Winter by Isabel Allende - My review post is available here; as usual, Allende's strong storytelling abilities shine through, as well as her wit and wisdom. I truly enjoyed her latest endeavor. Hands down, The Rules of Magic by Alice Hoffman! I had a phenomenal mini-vacation to Chicago during the first weekend of the month: I drank, ate, ran (a little), cheered (a LOT) for participants of the Chicago Marathon, and attended my VERY FIRST Cubs game (which also happened to be a playoff game) - what a treat! Thanks for the pic, Ali! Next week, I'll travel to Virginia to run in the Richmond Half Marathon (more details on this in a post next week) and...drum roll, please... finally meet Sarah of Sarah's Books Shelves IN REAL LIFE! Nonfiction November is in full swing, so I'm hoping to read as many nonfiction titles as I can; I'll be posting a few possibilities on Instagram today, thanks to the challenge put together by Kim at Sophisticated Dorkiness. If things go well in Richmond, I may attempt to run another half marathon (local) before the end of the year...to be determined! Stranger Things has returned; is anyone watching? I LOVE IT. My fantasy football team is currently tied for first place in the division; hoping I can make good choices and stay strong through the rest of the regular season!